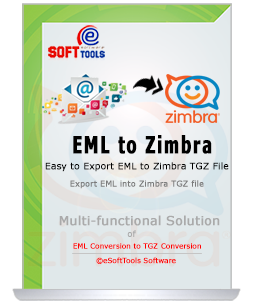 eSoftTools EML to Zimbra Converter Software has ability to convert selective Single and Multiple EML Files/Folders into Zimbra with emails and attachments. EML to Zimbra Conversion Software let you add multiple EML files from different mails clients- outlook express, thunderbird, windows mail and many more to convert data into Zimbra TGZ file. Allows Convert All EML Files Items- It perfectly convert EML emails with attachment to Zimbra file. Add EML Folders- Software facilities to add ‘n’ number of EML folders for conversion. Displays Working Status- It shows total number of EML file (0,1,2….) convert into .tgz Zimbra. No Need of Installing Any App- To Export EML to Zimbra there no need to install any application like- Outlook Express, Windows LiveMail and MS Outlook etc. Save 15 Emails Free in Demo - The demo version app allowed to export 15 EML files to Zimbra for evaluation. Batch Mode Conversion - Software allows to load EML files from different-different location and make the conversion in bulk. EML to Zimbra Converter Software is result provider app that convert complete items of EML file into Zimbra .tgz. It will export EML details such as- user profile pic, first name, second-name, emails address etc to Zimbra. EML to Zimbra Software provides the better features to users if they want to export multiple EML folders at a time. Our software easily handles multiple EML folders and export into Zimbra TGZ file and also maintains the same folder hierarchy in Zimbra. Software has the power to fulfill the conversion process in single mouse click. After adding the folders within software, click on "Convert Button" to export all EML files to Zimbra TGZ file with complete folders hierarchy. EML to Zimbra Converter Software scans EML file and convert EML to Zimbra with displaying working status in which it mentions how many EML files is going to convert into Zimbra that will helps you to know about total number of EML file conversion. EML to Zimbra Software gives 100% guarantee to preserve folder, sub-folders structure while conversion. There no changes will be done by the software during export EML to Zimbra and also extract emails meta data to export. Before purchasing full license key of EML to Zimbra Software; there users can download TRY DEMO version where they can get know how to import EML to Zimbra or also save 15 emails per EML folders. And after satisfaction buy full version. Do I need to Install any application to use the software for conversion EML to Zimbra? No, you don’t need to install any third-party application; simply download the EML to Zimbra Converter Software and convert EML file to Zimbra TGZ. Can I Convert Multiple EML Folders into Zimbra at a time using your software? Yes, eSoftTools EML to Zimbra Converter Software provides an option “Add Multiple Folders” where you can add multiple folders and after than simply convert them into Zimbra file. Can I convert thunderbird .eml file into .tgz Zimbra by Software? Yes, this EML to Zimbra Software capable to convert any eml file created in any mail clients like- Thunderbird, Win Mail, Windows LiveMail and Outlook Express into Zimbra. Will EML to Zimbra Software make any changes in EML data after conversion? No, there no changes will be generated, You will get your actual data of EML file after conversion in the form of Zimbra .tgz file. On which location, the Software will save my converted EML to Zimbra data in my machine? You can select your own location; Software ask you to select the location in your machine to save the converted Zimbra data. I just want to say thanks to you; I have used your Software with the intention to convert outlook express EML file to Zimbra and the software worked well and didn’t harm my internal EML file data at the time of conversion. This is really a safe and secure utility to Export EML to Zimbra.